Coachella, everyone’s favorite fashion show of a music festival, is right around the corner. Which means, it is time to start outfit planning! Traditionally, festival-goers are down to wear just about anything, from designer dresses to only pasties and shorty shorts. However, Coachella is THE festival to go all out with of-the-moment fashion and rock the hottest festival looks. Given the cool-girl scene, and the many, many Instagram opportunities (pro tip: The Ferris wheel is a must gram), you want to bring your best festival outfits to Coachella 2019. While denim shorts, booties, and flowy white dresses will always be Coachella staples, the 2019 trends below will elevate your Coachella outfit to next level cool. Check out our Coachella 2019 Outfit Inspo Video! 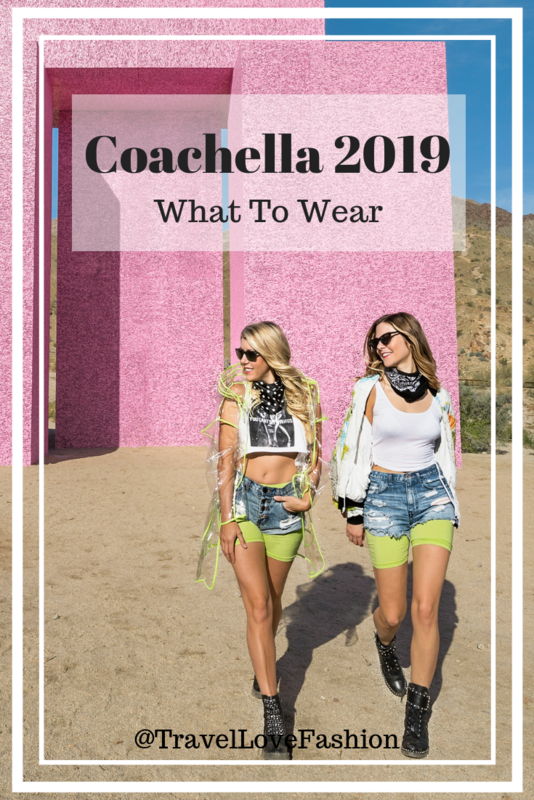 Here are the 4 top trends to shop while planning what to wear to Coachella 2019. Stand out in the crowd in bright neon of pink, yellow, or green! And have the bonus of not losing your friends! This trend works at Coachella whether you take center stage in a full neon outfit or add neon accessories. Ok, yes, fringe is pretty commonplace in music festival fashion, but this year go beyond the bohemian vibe. Load up on fringe details wherever possible – boots, jackets, dresses, and vests. Nothing is more fun to dance in! Bring on the cowboy boots, bolo ties, and belt buckles! Western wear isn’t just for Stage Coach this year. The highlight on this Coachella 2019 outfit trend will be on the boots, but western details abound the standout for this year’s cool girl festival outfit. ME-OW. Animal print is one of the hottest trends of the year and is sure to spice up any festival getup. Add just a pop with a leopard hair scarf, or go all out in a snakeskin two-piece, you really can’t go wrong with animal print. Most importantly, have fun with your wardrobe. Rock the unusual pieces you can’t seem to find the right occasion for and don’t forget those essentials, like a proper bag and sunscreen. You can see the 10 steps to the perfect Coachella outfit HERE, and our FULL fashion girl Coachella guide HERE. Any trends you think will be big to wear at Coachella, or any music festival, in 2019? Please tell us in the comments below! Thank you and happy Coachella!